Oh my goodness, I LOVE these smoothies. If you make them with real raw milk, it can be a highly nutritious treat for you and your family. Enjoy! 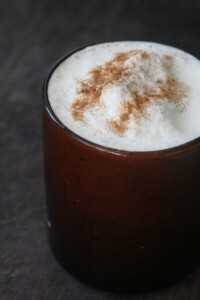 This is not really a Horchata drink, traditionally made with starchy rice, but it is a delicious slushy drink that tastes just like Horchata, or maybe more like cinnamon-vanilla ice cream. Puree ingredients in a blender until smooth. Top with a sprinkling of cinnamon, and enjoy!